Covadonga is a unique collection of clothing produced as a limited edition to celebrate the first year that a Kalas equipped team will ride the Vuelta. The Covadonga is the one of the most iconic climbs featured in this year's tour and will be a major factor in the GC. The temperatures could soar above 25C and these bib-shorts feature side panels made from our highly breathable Verano Flex fabric to match the excellent moisture management of the Covadonga Jersey. The shorts also feature our new 3D Endurance pad from Elastic Interface, developed to keep the rider cool and our work with professional teams has resulted in carefully sculptured braces to ensure a comfortable fit and strategically placed inserts provide breathability for added cooling. Compressive and highly functional Goffrato fabric. Mesh inserts positioned on the back of thighs to provide better elasticity. Elastic bibs constructed with bonded seams. Flat seams to ensure maximum comfort. Anti-slip leg grippers stitched with reflective flat seams. Innovative Italian fabrics Goffrato provides high elasticity and maximal muscle compression. These attributes guarantee free movement when racing or training. Our new revolutionary cycling pad Endurance 3D has been constructed in collaboration with the world's leading manufacturer Elastic Interface cycling pads, using the latest technologies. It provides maximum protection and incredible comfort during long and demanding rides. 3D anatomic shape achieved thanks to two half-moon components for enhanced fit. Special frontal top features an additional perforation to allow best air permeability. 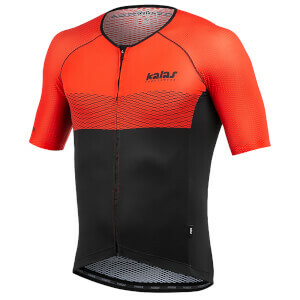 Perforated layer for enhanced air flow and ventilation throughout the whole chamois. Ultrahigh density inserts of 200/kgm3 specifically shaped and designed to cushion main pressure points. EIT CARBONIUM FLASH material has special channelled structure for enhanced air flow and ventilation. 80 density 6 mm thick insert purposely located in the front area for improved flexibility.